Staying current on key issues relating to talent, inclusion, and leadership is key—staying ahead of these issues is critical. Toigo is ideally positioned to provide thought leadership insights that benefit institutions and individual leaders. Our network spans both—talent and employer, individual and institution—and as a result provides a unique 360-degree perspective. Our role is to help leaders navigate forward. This inevitably includes tackling weighty topics. That’s the goal of our thought leadership: A timely, current and candid take on issues that matter to diverse leaders. If you have an idea for a topic to tackle or conversation you believe should happen but isn’t, reach out. We’d like to hear from you and see if Toigo can bring some needed perspective to mix. Toigo is committed to promoting careers within the plan sponsor community to increase the presence of minority professionals at levels from summer internships to more senior investment roles. Consider utilizing ToigoPRO or encourage your search firms to explore how they may benefit from tapping into our talent for your opportunities. Career Crossroads: The Talent Migration from Finance to Tech – Real or Overrated? To help finance firms understand talent retention issues, including departures from finance to technology firms, Toigo conducted a survey and focus groups with mid-career professionals (6-10 years post-MBA). The result? 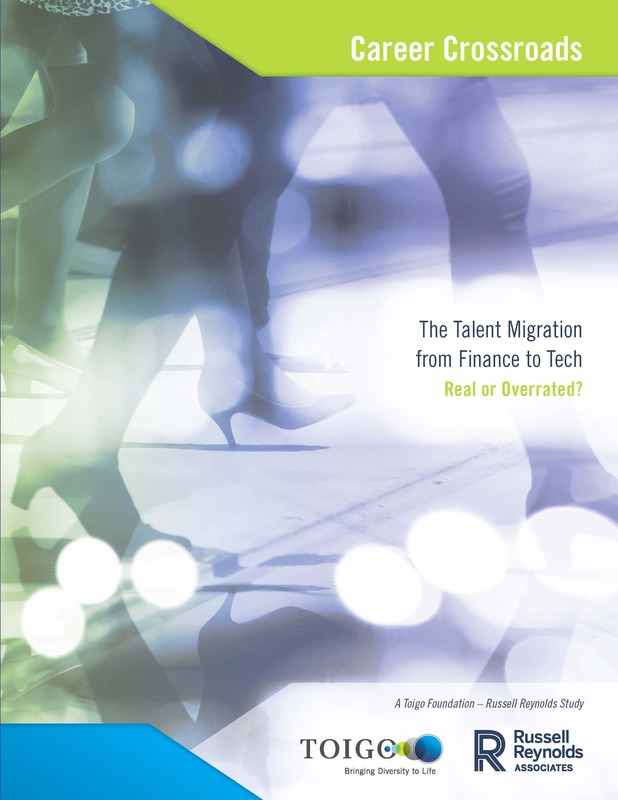 Career Crossroads: Core Drivers Behind the Talent Migration from Finance to Technology and Strategies for stemming the Tide -- a new thought leadership report and the start of what Toigo hopes is a productive conversation. 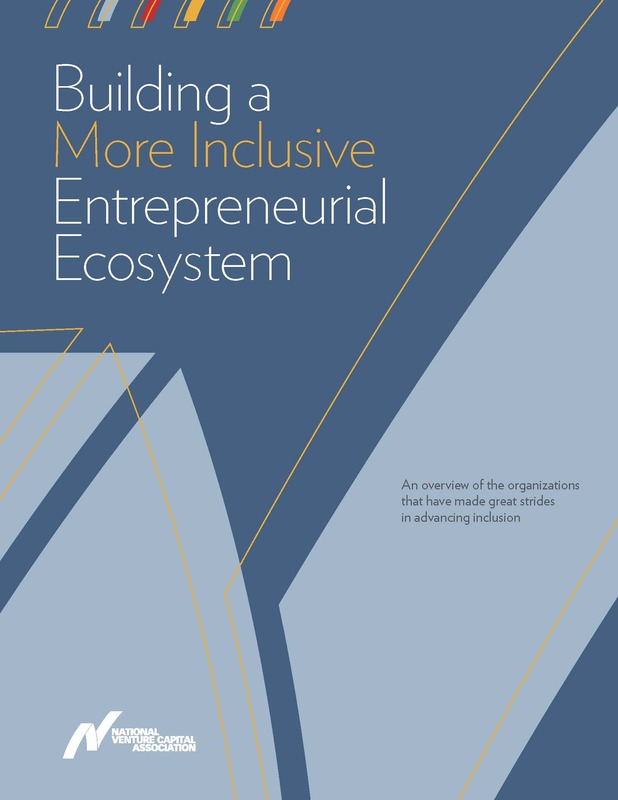 What near- and long-term shifts should finance organizations consider to provide a greater sense of inclusion? Is there too much focus on diversity (on the numbers) and not enough on inclusion (a sense of being valued as an individual)? Is FinTech really the bridge between a career in finance and technology? The venture capital industry sees diversity as an important issue and is starting to deal with it, says NVCA's Diversity Task Force in its first report. "This is the opening of the discussion. But what I think is gratifying is people recognize its importance." - Venky Ganesan, chairman of the NVCA board. 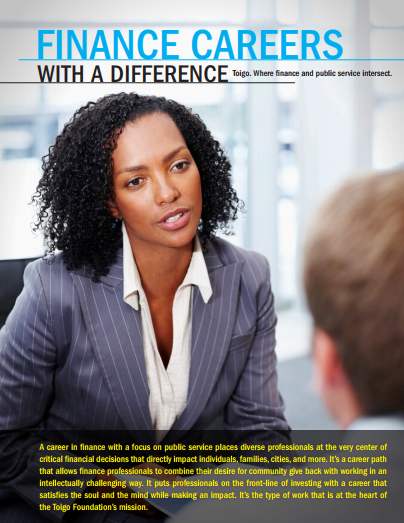 Toigo is a proud partner of the NVCA. Toigo’s unique perspective in the marketplace anchored this in-depth analysis of the absence of diversity within the asset management sector. Several Toigo alumni and board members are featured. Whether entering the business world, ascending the ladder, or capping a successful career, everyone benefits from mentoring. 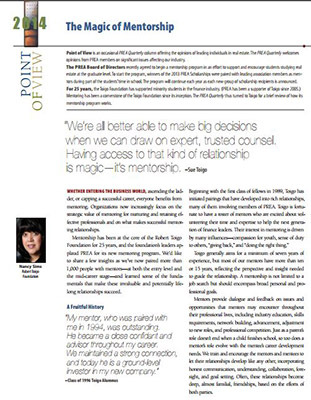 Organizations now increasingly focus on the strategic value of mentoring for nurturing and retaining effective professionals and on what makes successful mentoring relationships. 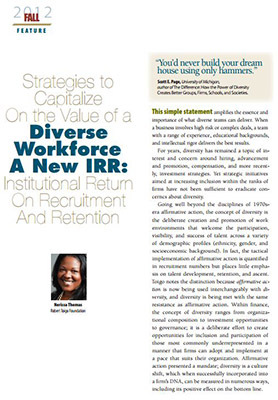 As featured in May 2012 Institutional Real Estate Letter. 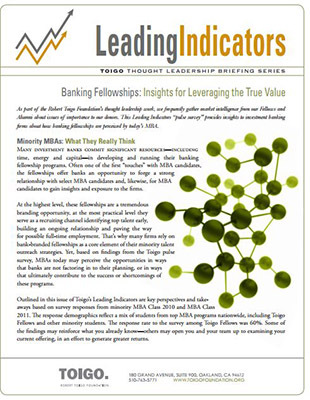 This 2010 Leading Indicators pulse survey provides insights to investment banking firms about how banking fellowships are perceived by today’s MBA. Facing an uncertain industry environment, many within the finance industry are reassessing their career options and future choices. 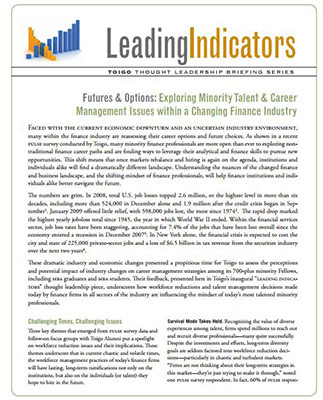 In Toigo’s PULSE survey, many minority finance professionals expressed a strong interest in exploring non-traditional finance career paths. This shift means that once markets rebalance and hiring is again on the agenda, institutions and individuals alike will find a dramatically different landscape. Learn more about the findings and the implications in Toigo’s Leading Indicators thought leadership piece. 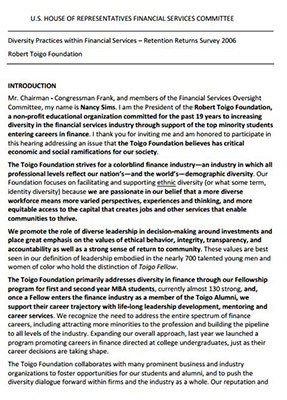 Toigo’s president Nancy Sims provided testimony before Congress on issues relating to diversity and retention of minority professionals within the field of finance. Sims offers insights into ways firms recruit and retain talented minority professionals, including the effectiveness of mentoring, performance management and other programs intended to help professionals succeed within the industry. The 2008 hearings were called in response to the 2006 publication of the U.S. Government Accountability Office’s (US GAO) report.